Indoor locations with lots of area and high ceilings are common candidates for high output lighting designs. Manufacturing facilities, warehouses, gymnasiums, wholesale outlets, aircraft hangars and shipbuilding facilities all have the common traits of large square footage combined with very high ceilings, which puts a lot of pressure on lighting systems to provide adequate illumination. Because of the extremely large size of these locations and the demanding nature of their applications, metal halide lighting with its high potential power output is the preferred type of lighting system used. Although some lighting specialists have begun offering high output T8 and T5HO fluorescent systems as an alternative to metal halide, metal halide still remains the most preferred system of choice for a variety of reasons. Fluorescent lighting does hold some advantages over HID metal halide systems when it comes to high bay applications. Cheaper lamp and fixture costs, fewer issues with end of life cycling and lumen deterioration, and cooler operation provide tempting potential that in some cases can help fluorescent outperform in some high bay applications. However, fluorescent systems have their own drawbacks which include poor cold weather performance, lower output requiring the installation of more fixtures, and the fact that in order to switch a facility from metal halide to fluorescent it is necessary to perform a full system wide changeover including entire new fixtures, mounting hardware, and in some cases wiring, which in turn means a slower return on initial investment that may make the switch less than cost effective. All of this often acts to cancel out the benefits of fluorescent systems and make them a less than ideal alternative to HID metal halide. One of the first things many may wonder is “what exactly does high bay and low bay mean? Well, according to the Illuminating Engineering Society of North America (IESNA), high bay refers to higher ceilings, typically 25 feet and higher in height. Low bay on the other hand usually refers to ceilings with heights below 25 feet. Buildings with such large square footage as these also tend to have a ceiling structure formed from a steel framework with an interior subspace which forms the “bay”, thus this in conjunction with high or low ceiling height results in the designation of high or low bay. For fixtures intended to produce high output and cover large interior spaces, the names high bay and low bay are also applied. 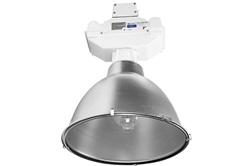 Although these fixtures may be designated as high bay or low bay, it is not unusual to find fixtures designated as high bay being used in low bay locations and the reverse, simply because with variation between fixture types and the needs of a given area, a specific fixture may be better suited despite its designation appearing to be contrary to the application. Metal halide systems are preferred for high bay applications due to their intense output, good color quality, high efficiency, and long lamp life. Metal halide lamps represent the most powerful form of industrial and commercial lighting and are capable of covering extremely large areas with relatively few fixtures opposed to other forms of lighting. Although other HID systems such as low pressure sodium and high pressure sodium provide similar overall lumen out, lamp life and efficiency, their very poor light quality makes them a poor choice for indoor industrial or commercial operations where light quality is a critical factor in maintaining safe and productive operations. The most common wattages used indoors are 250 watt and 400 watt, with higher wattages often being considered too intense and hot running for practical indoor use. Although it is potentially possible to use higher wattage metal halide and thus require fewer fixtures to cover a given area, using more fixtures of lower wattage also provides more even coverage and conformity. The basic metal halide lamp components consist of a three electrodes within an arc tube containing mercury and other metal salts, or that is, metals in iodide form. One electrode provides the starting power for striking the initial arc that ignites the lamp, and the other two provide maintenance voltage for continued operation. Since metal halide lamps have no wire filament as is the case with incandescent bulbs, they are much more durable and resistant to damage from vibration and rough operating conditions. However, because the arc tube and bulb are made from a type of glass, they are fairly fragile, and because of the intense heat they produce, extremely sensitive to contamination in the form of moisture and oils. Metal halide lamps do not offer any dimming capabilities and as such are poor candidates for locations where variable illumination levels may be desired. Metal halide lamps also display color shifting over the course of their operating life as well as lumen degradation, both of which can be significant within a fairly short period of time under the right conditions. Regardless of operating conditions however, metal halide typically demonstrates 20 to 30% lumen loss by the 40% of service life mark. This is not to say metal halide isn’t effective in the long term, but it does point out the need for a cohesive relamping regimen if color quality and output uniformity is to be maintained across a large number of fixtures. An alternative to standard metal halide systems that has been gaining in popularity is the “Pulse Start Metal Halide” lamp. Pulse start metal halides have been used for decades at lower wattages, and advancements in HID technology have now allowed pulse starting designs to be effectively used at higher wattages as well. Pulse start metal halide systems offer the advantages of faster hot restrike times, better lumen maintenance, higher energy efficiency, and better light quality. The design of a pulse start metal halide is different from a standard metal halide however, with two contact probes rather than three and an ignitor added to produce the initial arc strike. This means that pulse start metal halide lamps cannot be used with a standard metal halide ballast, and instead must be used with the correct pulse start type ballast.